The College’s Learning Center inaugurated its new space in the A.C. Buehler Library with a week of festivities and a ribbon-cutting ceremony. On Friday, Feb. 8, the College held a ribbon-cutting ceremony to celebrate the opening of the new Learning Center. Located on the main floor of the A.C. Buehler Library, the new space is both larger and more flexible than the Center’s previous home in the Frick Center. 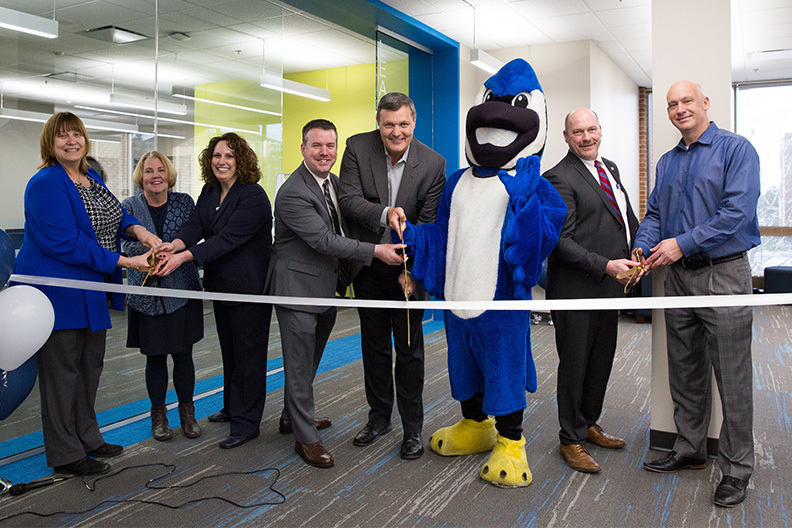 Friday’s ribbon-cutting was the culmination of a weeklong celebration that included giveaways, sweet treats, photo ops with President Troy D. VanAken and mascot Victor E. Bluejay, and an Instagram contest. Designed to be open and welcoming, the new space features a large open area with furniture that can be moved and reconfigured to accommodate different learning groups. Smaller multipurpose rooms offer a quiet setting for test taking or private sessions. The Learning Center provides free tutoring in math, writing, science and other subjects, along with classes on study skills and standardized test preparation. It also houses the Office of Access and Disability Services. The expansion of the Center ties in closely to the Elmhurst College 2021 Strategic Plan, whose priorities include boosting academic excellence and student success.